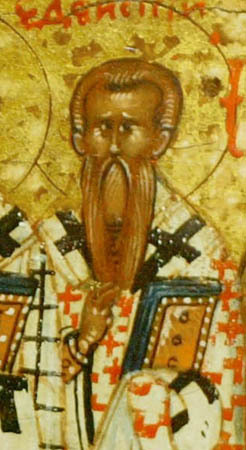 Saint Theodore, Bishop of Edessa, was born in the Syrian city of Edessa. All his life the holy saint was a bright witness of the great deeds of God, glorified in His Saints. At twelve years of age, after he lost his parents and gave away his inheritance to the poor, he went to Jerusalem, where he was tonsured at the Lavra of the St Sava the Sanctified. After twelve years of fervent monastic obedience and then another twenty-four years of full seclusion and great abstinence, the Lord called the valiant ascetic to be a bishop, so that he might enlighten the world. After the death of the Bishop of Edessa, no worthier successor was found than Theodore, and with the mutual consent of the Patriarchs of Antioch and Jerusalem, and of the clergy and laity, this fine man was chosen bishop. It was not easy for St Theodore to forsake his solitude, but he submitted himself to the will of God and undertook his pastoral guidance of the Edessa Church. This occurred during the reign of the Byzantine emperor Michael and his mother Theodora (842-855). At the time of St Theodore's episcopal consecration, there occurred a great miracle. The people beheld a dove, white as snow, flying about beneath the cupola of the church, which then alit upon the head of the newly-made bishop. St Theodore devoted all his abilities to the governance of his flock. He was a model for the faithful in word, in life, in love. By the good example of his holy ascetic life, he guided the flock entrusted to him by God, onto the path of salvation. Theodore exerted much effort in the struggle with heretics, and with a firm hand he guarded the Church from temptations and false teachings. By his consolation and support for StTheodore, the clairvoyant Elder Theodosius the Stylite also served the spiritual community while laboring in asceticism not far from the city, near the monastery of the holy Great Martyr George. With the blessing of the Elder, St Theodore journeyed to Baghdad to the caliph Mavi to complain about unjust measures against the Orthodox. Having come to Mavi, the saint found him seriously ill. Calling on the help of the Lord, the holy bishop threw a bit of earth from the Sepulchre of the Lord into a vessel of water and gave it to the caliph to drink, and the sick one was healed. The grateful Mavi, favorably disposed towards the saint, happily heard his teachings. Finally, together with three close associates, he accepted holy Baptism with the name John. Shortly afterwards for his open confession of faith in Christ before the Moslems, the caliph John was killed with his three associates. Having appeared in a dream simultaneously to St Theodore and to Theodosius the Stylite, he said that he had been granted to suffer for Christ, and was numbered among the ranks of the Martyrs. He promised that soon he would meet them in the Kingdom of Heaven. This was an indication to the saint of God that his own end was approaching. In 848, again in solitude at the Lavra of St Sava the Sanctified, he peacefully departed to the Lord. St Theodore has left Christians his edifying writings. 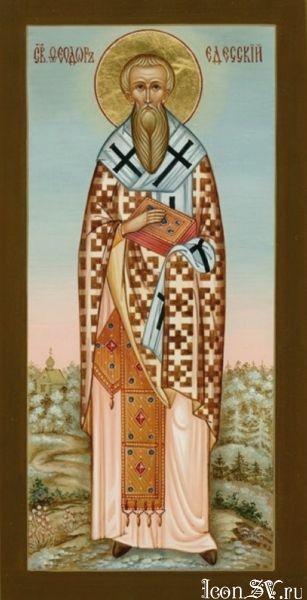 The Life of St Theodore of Edessa was popular reading in Rus during the sixteenth and seventeenth centuries, and was preserved in many manuscripts.